The Mekong River is one of the world's most important waterways, and with a length of about 4.4k km (about 2.7k mi), it's one of the dozen longest rivers. It rises in Tibet and runs down the southeast side of the Indochina Peninsula, discharging into the South China Sea in Vietnam. Its valleys and those of its tributaries feed hundreds of millions. Benandstories created this awesome drone video of the river near its mounth, on the Mekong Delta near Ho Chi Minh City (formerly Saigon). 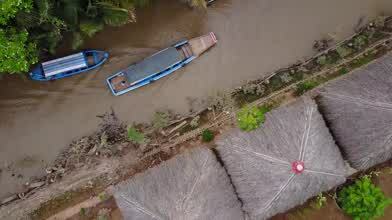 Description: Lost in the Mekong delta with the Mavic and my camera!